Ben Millar’s life feels like any other ex-pat romance, he drinks too much coffee, moans about the French and has just found out he has an unfaithful girlfriend. 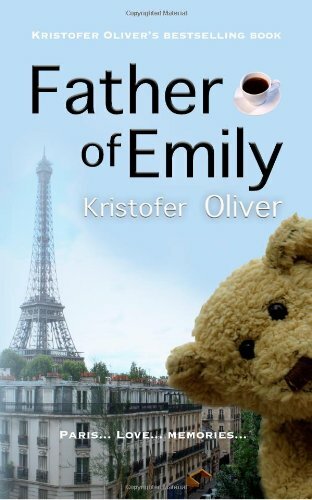 Almost a decade after he has left England he is forced to take on an emotional journey of discovery as fourteen-year-old Emily, the daughter of his teenage love Clara, comes to visit him in Paris. This new relationship makes Ben face his fears, his past and the guilt of leaving her mother – the girl he said he would never leave. Nothing could prepare Ben for the surprises that Emily brings with her. No, as the blurb tells you, this is a story about love – lost, new and found. It’s a touching story, with odd moments and incredibly lovely ones, just like life is. The writing is lovely, it’s sharp, very expressive without getting swamped in “big words”, it’s coquette in a way, if you’ll pardon my French. 😀 The plot is interesting, and it kept me guessing a lot, though by the end it turned out to be less of a head-spinner then I suspected it may turn out to be while reading. Ben was awesome as a character, and I loved Emily. I had a few laughs about Ben’s love life, I mean I couldn’t help it, the guy seems to have a very odd way of picking his friends. But overall Ben struck me as an incredibly lonely person, I mean his “friends” are funny and sort of outlandish and quirky, but their main trait seems to be that they’re quite unreliable people that either stab you behind your back or are quick to make up their mind about you and jump to nasty conclusions and judge you. I mean, me reading the book, I can jump to conclusions about something along the way, but I’m not Ben’s friend, you know? You probably don’t make a lot of sense out of this, you’ll just have to have read or go read the book for this to fully make sense. I had mixed feelings about Clara, Em’s mom. She’s that kind of character that makes things exciting and fun and unpredictable, but the sort of person I personally would rather not meet, you know? She gave me this off feeling, I don’t know. Maybe because she seemed to be such a demanding person…I tend to dislike demanding, sort of clingy (here and there) people for some reason. But aside those parts of her personality, she was surely charming in her own way. My heart went out to her and Emily, that’s for sure. Now, the story read very well for the first half, and then I had issues with it for the second. From the moment Nicholas made an entrance, I was feeling iffy about the whole thing; I didn’t like him, and later on when we got to meet his daughter (certainly didn’t like her, the brat) and his brother, with the whole circus thing, I mean…it got slightly surreal for a bit, which was good. The doubt that was planning over Emily’s feelings towards Ben and their interaction, that was the off part for me. I mean, I understand how it works for the final resolve of the whole thing, and how it makes sense and all that, now that I’m finished reading it. But there were moments, especially when they were visiting this Nicholas dude, when I was so iffy about the whole thing, I had to take a lot of breaks while reading before finally making it out of that state of mind. Of course, after I did make it out, I was glad I persevered and read the book.